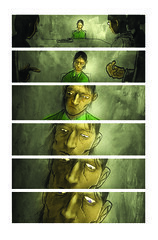 A couple of "quiet" pages from Groom Lake issue 2. If you missed the first one & still want it, ( it sold out at distributor level awhile ago ) you may still be able to get a copy at the IDW online store here. Issue 2, as is the way with comics, is a smaller print run and usually isn't enough to meet demand so if you see it, get it quick or get your retailer to get some more in before they're gone too. I loved number #1. 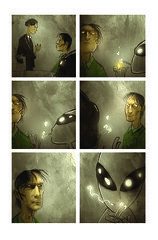 Apart from the awesome art, the plot had some great little twists in it that I didn't see coming. It's great to see you and Chris Ryall working together, and I can't wait to see where the story goes! Hey Ed, cheers for ordering a sketchbook or two off my Cafepress page! Hope you like em.